7 July 2013. 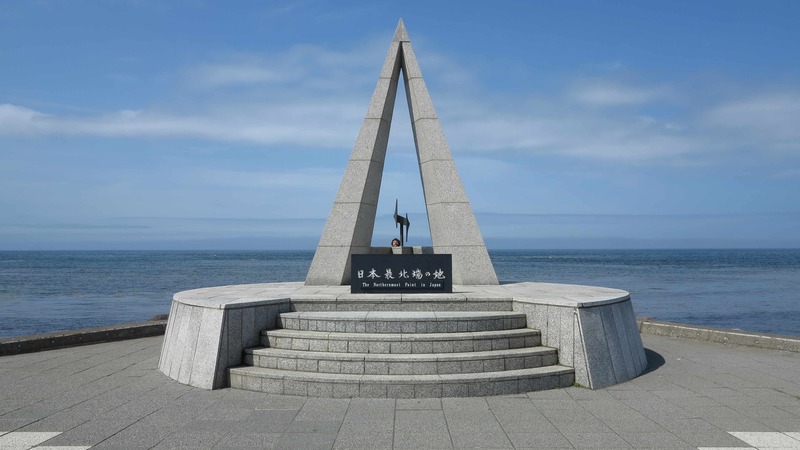 After enjoying the festivals of northern Hokkaido, we drove up to Cape Soya, the northernmost point of Japan. 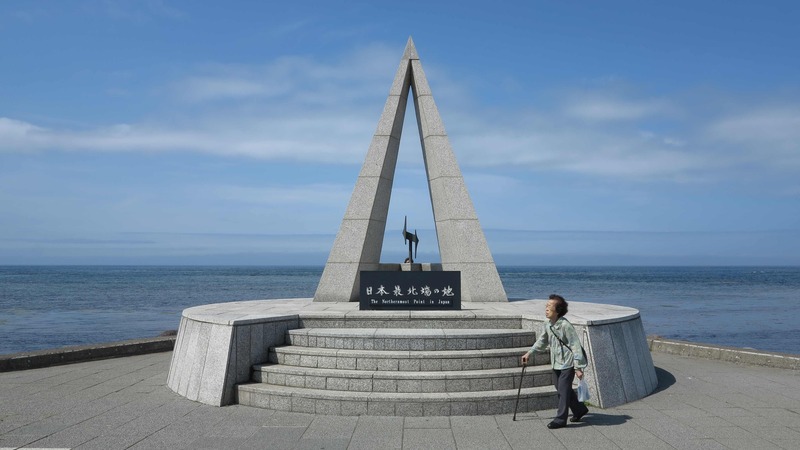 Or actually, it is the northernmost point of “the easily accessible part of Japan” as some panel put it, because the true northernmost point is on a small deserted island about 1 km northwest of here. You have to be precise! 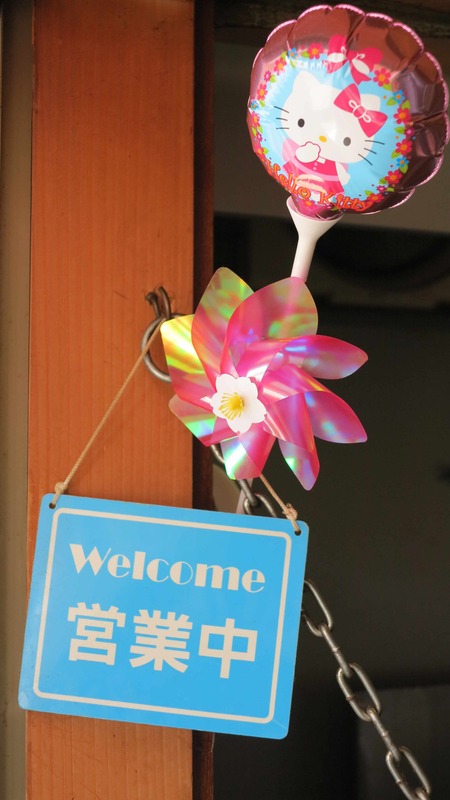 We were welcome! At least in the ice cream booth. 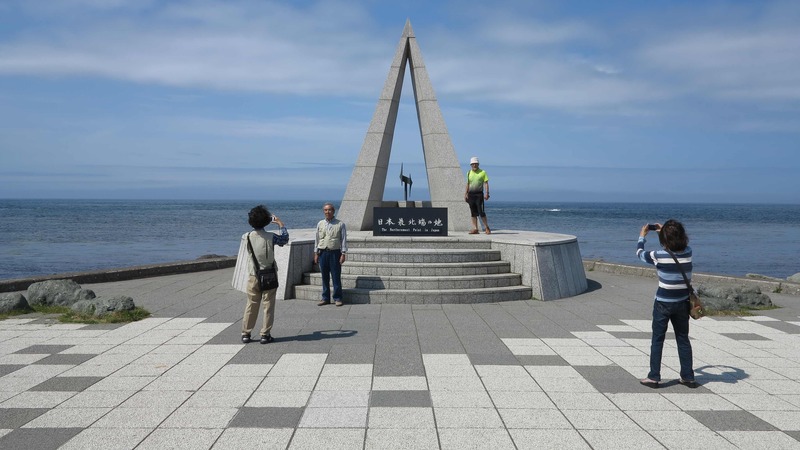 Marco and the Monument of the Northernmost Point of Japan. Out there, just 43 km away is Russia, Sakhalin Island. 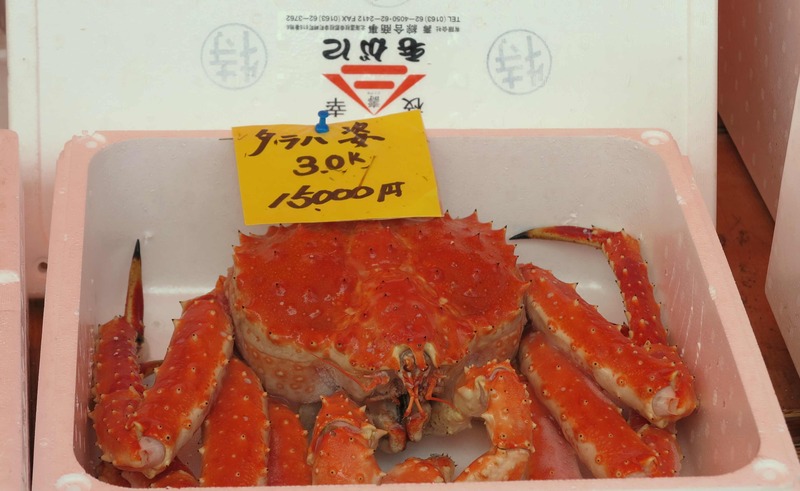 This photo is included to highlight a peculiar thing about the Japanese…. We see again and again the Japanese husbands posing for photos by their wives. And it is not because the wives are forcing them to get up there in front of the monument. No, the husbands are usually passing orders to the wife on where to take the picture from, zoom in on me here or include this thing over there, then he checks the picture and if he is not satisfied the wife will have to repeat the effort! On the photo below we had the pleasure of observing two simultaneous wife-photographing-husbands. 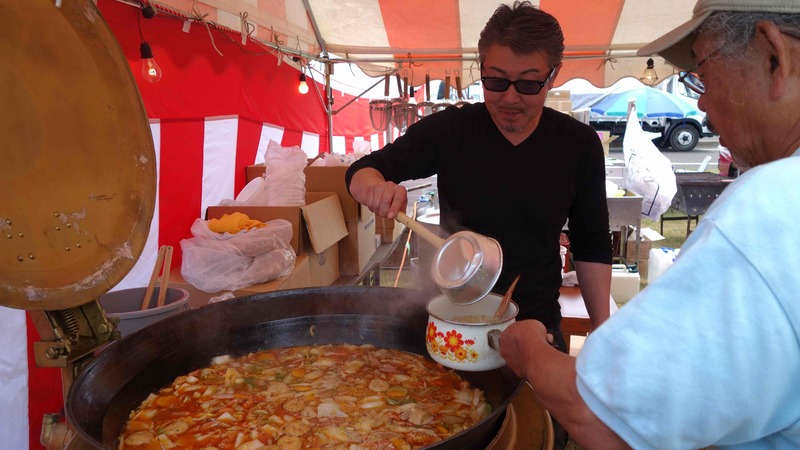 In Wakkanai we just missed the local festival, a shame but you can’t do everything. But we still found new friends – or rather Frida found new friends at the free campground in the city park! And this, here and now, is an appropriate occasion to say good bye and thank you to Japan and to the Japanese! It has been such a pleasure to travel here and to meet the Japanese people who are so curious, so friendly, so passionate and so lucky to have such a beautiful home country! 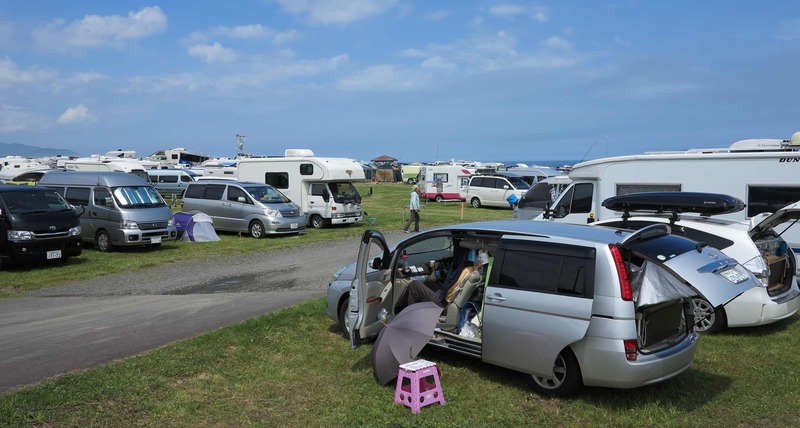 Summer in Hokkaido is short but intense! The men get out there with their chainsaws in short sleeves and the rest of us get on the road to enjoy the sun, the fresh air and the festivals! 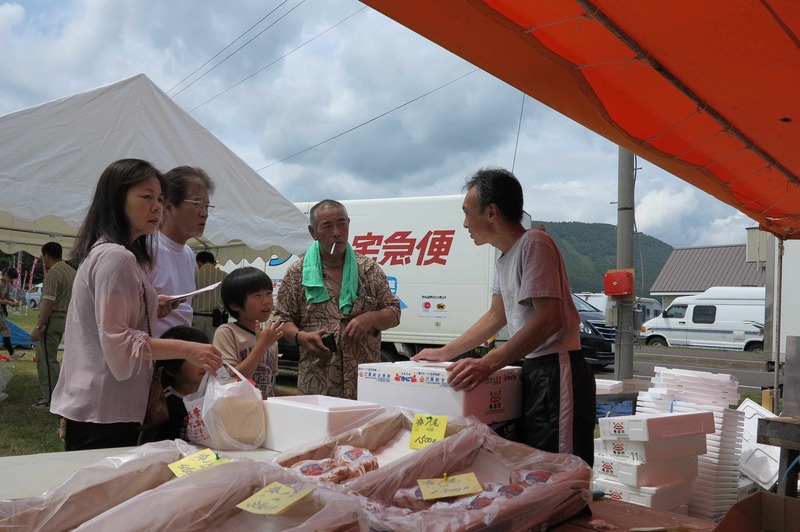 In northern Hokkaido we were lucky to run into two of the local summer festivals. 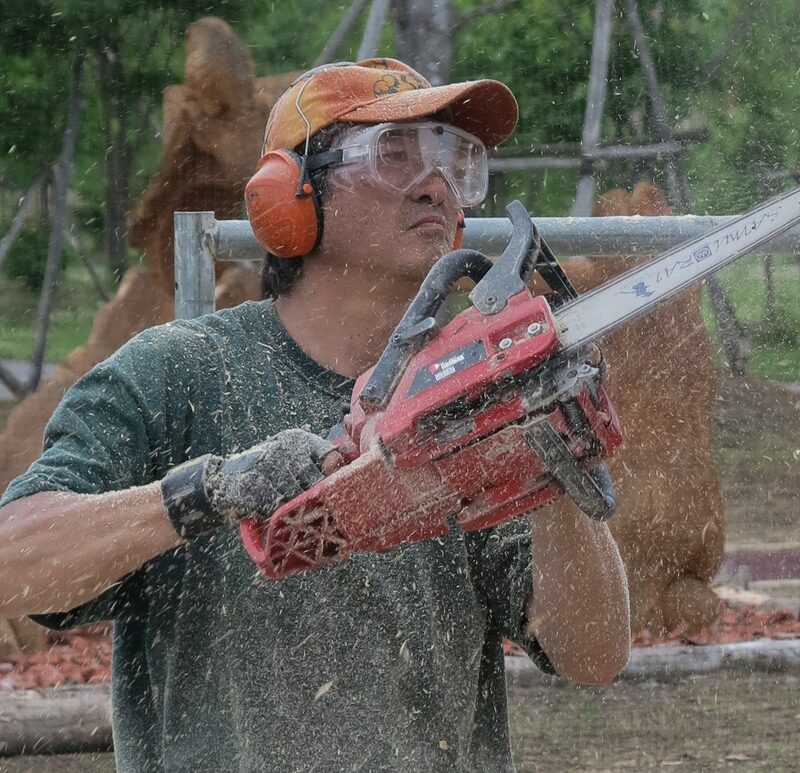 The first one was the chainsaw masters competition in Shimokawa! 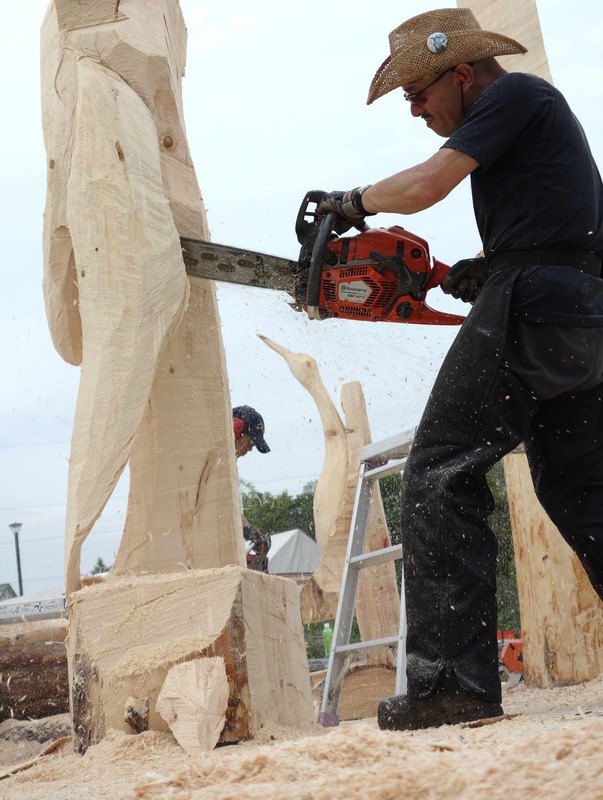 The noise was deafening as about 10 men were working away with their chainsaws to create sculptures out of big logs of wood. They had 3 days to complete their work. We were there on the first day when the first rough work was done to cut the outline of the sculpture. 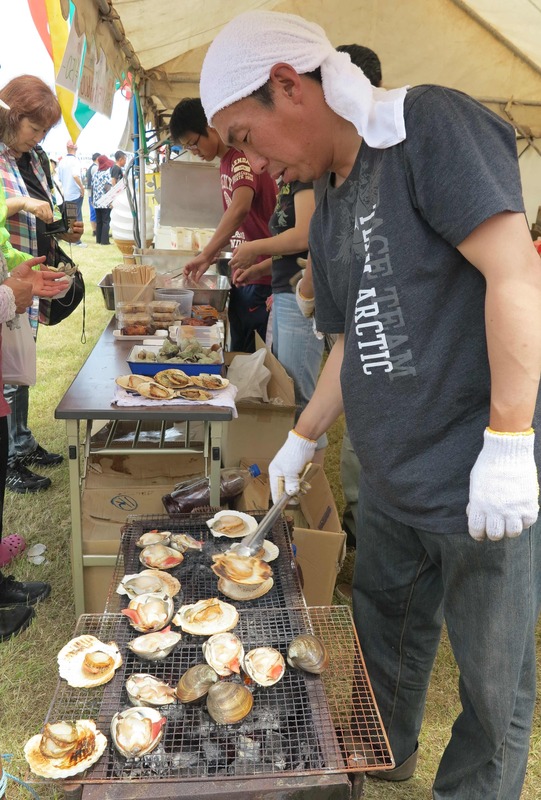 The second festival was the crab festival in Esashi. We were there early in the day when everyone got filled up on delicious crab meat as well as freshly grilled squid and scallops. But it was obvious from the amount of still-empty beer & burger tents, that later in the day also the beer would start flowing in great amounts and we could see that a music stage was being put up so……yes! 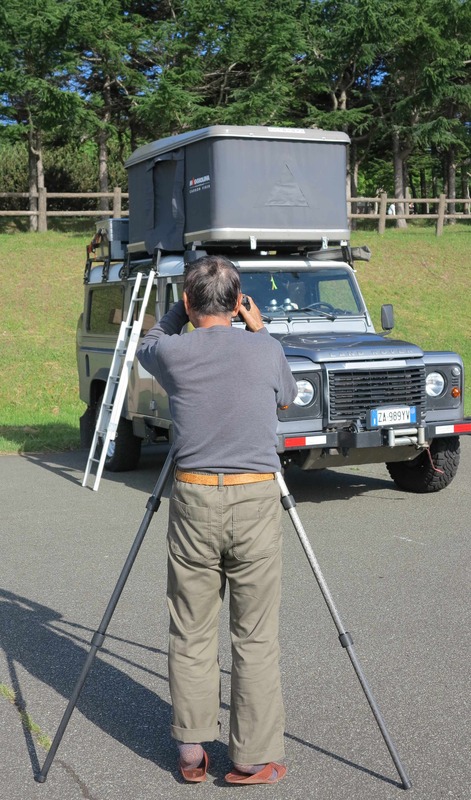 Camping the Japanese way. You don’t need a “big rig” to camp in style. Lots and lots of people had come for the crab festival. First point on the agenda was eating! 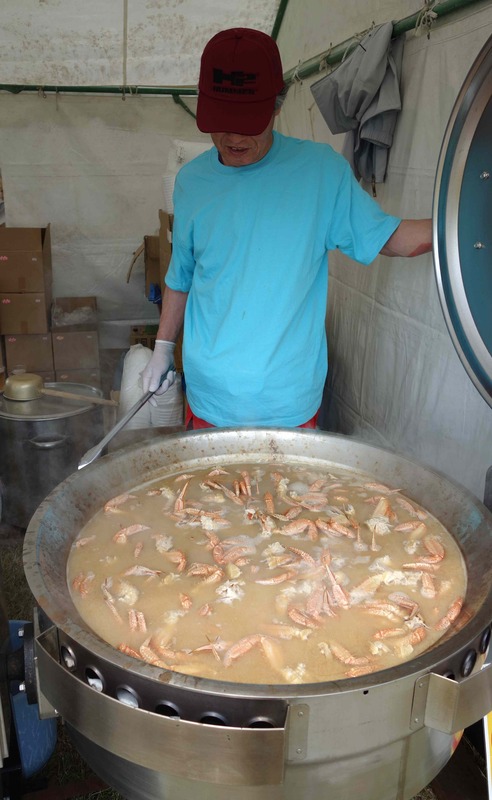 There were many tents selling delicious fresh seafood. And a lot of people also came to buy the fresh crabs. How about this guy, 3 kg for 150 USD! 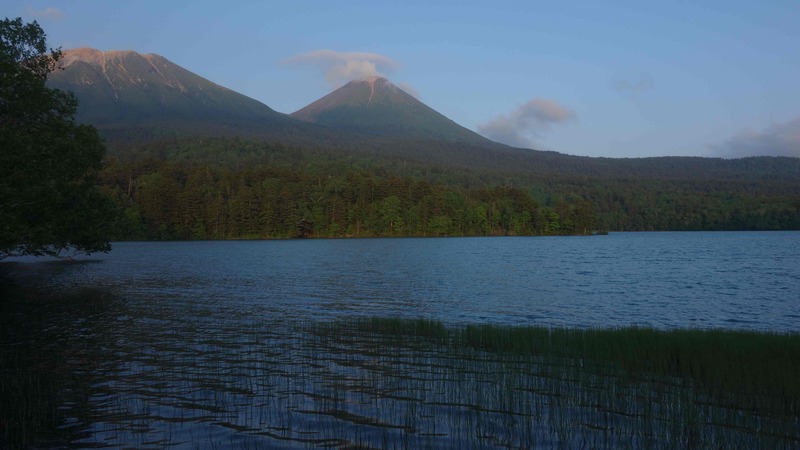 We came back to Hokkaido to take the ferry to Russia but also to hike on the Shiretoko Peninsula! 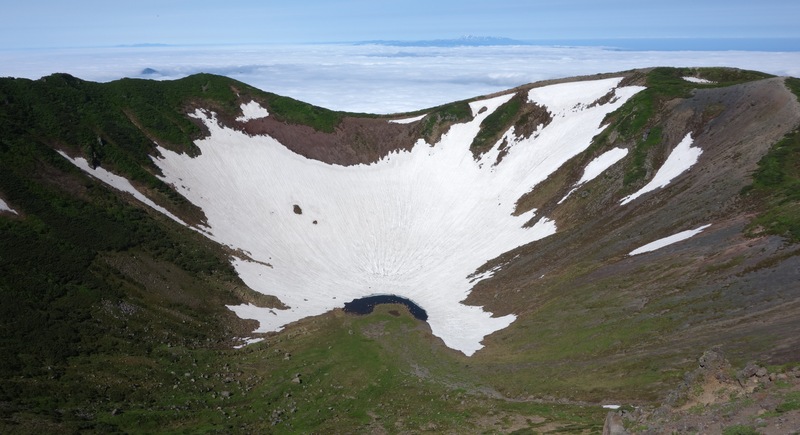 The Shiretoko is the northeastern most protusion of Japan, from here you can see the Kuril Islands of Russia (or occupied Japanese territory). In Aino language the name means the end of the world. It is a UNESCO world heritage national park and it is full of bears and other wild life. Sound nice! Last time we passed here there was too much snow to do any hiking so we were hoping for better luck this time. Unfortunately the weather turned out to be nasty. Very high winds and forecasted rain. 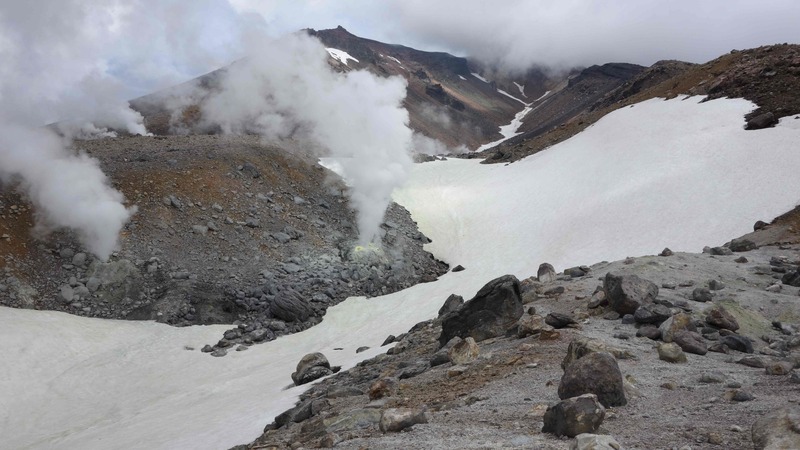 So finally, we decided to turn around and go back to one of our favourite places in Hokkaido: Asahidake! 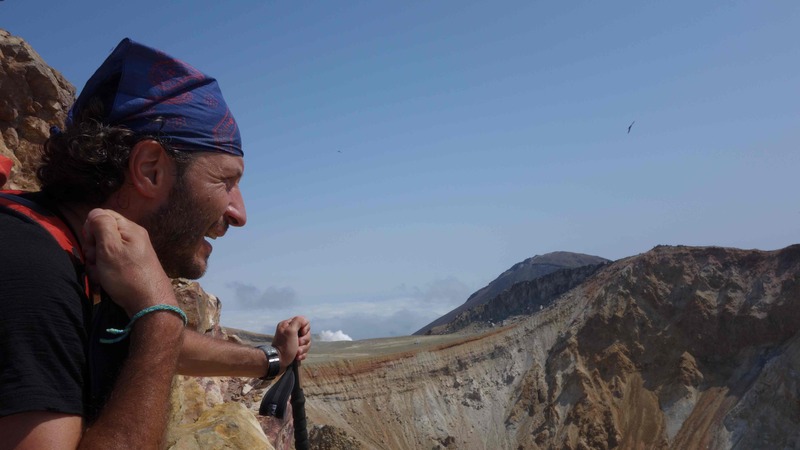 Here the weather is a bit better and just as important, we knew that we could get ourselves installed in the Daisetsuzan Shirakabaso hostel at the base of the Asahidake volcano. 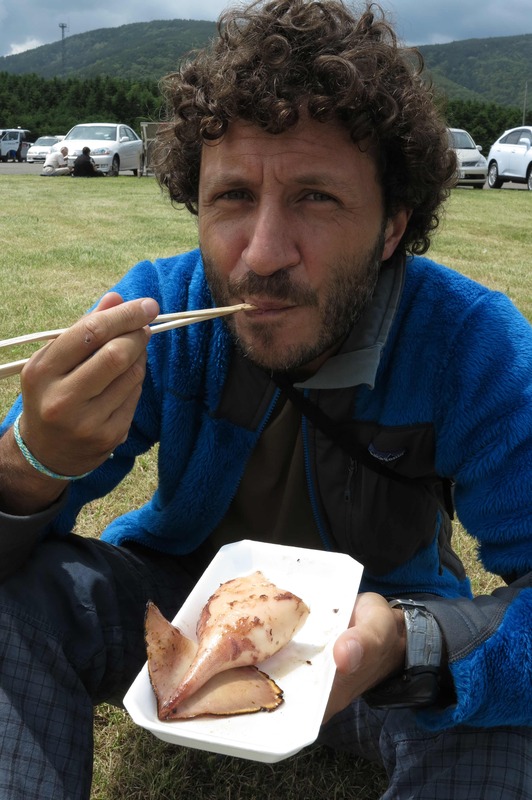 Here we are enjoing excellent food and rotenburo, the outdoors hot spring bath. A bit of luxury before Siberia! 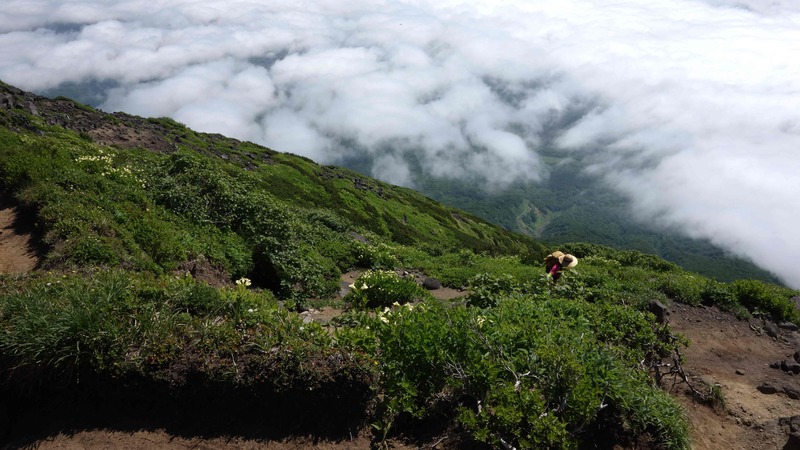 Hiking up the steaming Asahidake volcano. 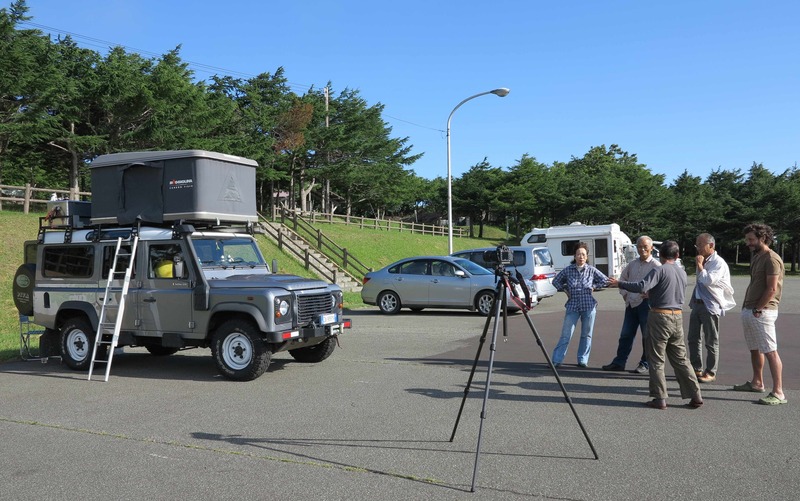 It is already July and we are slowly making our way north, to Wakkanai, from where we will take the ferry to Russia, Sakhalin Island. 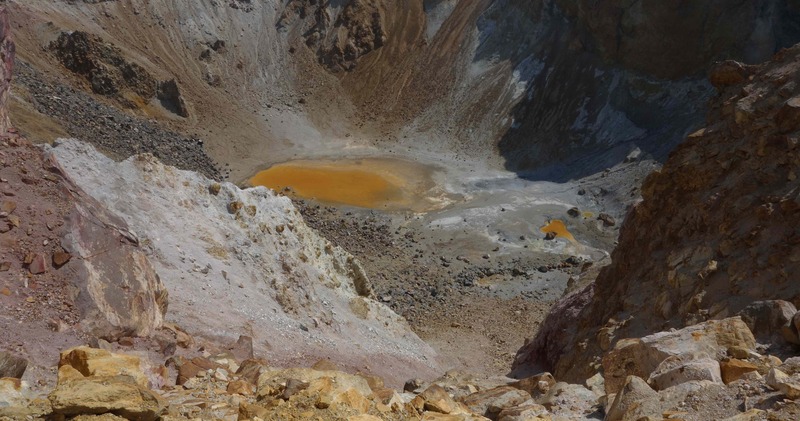 While on the road, we suddenly had a view to two beautiful volcanos, just a bit off the road. It was still early in the day so we decided to make a stop and climb the largest one of them which turned out to be Meakan, 1499 m high, also known as “the husband” as opposed to the smaller neighboring volcano which is “the wife”. 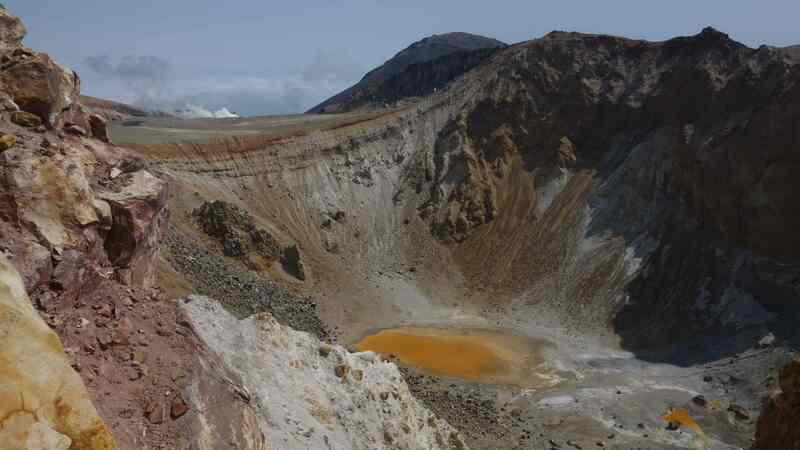 Here the husband is on the crater rim of “the husband”. And here the husband and the wife of top of the husband with a view to the nice wife in the background. Ok? In the night we camped here, on the shore of Lake Onneto. 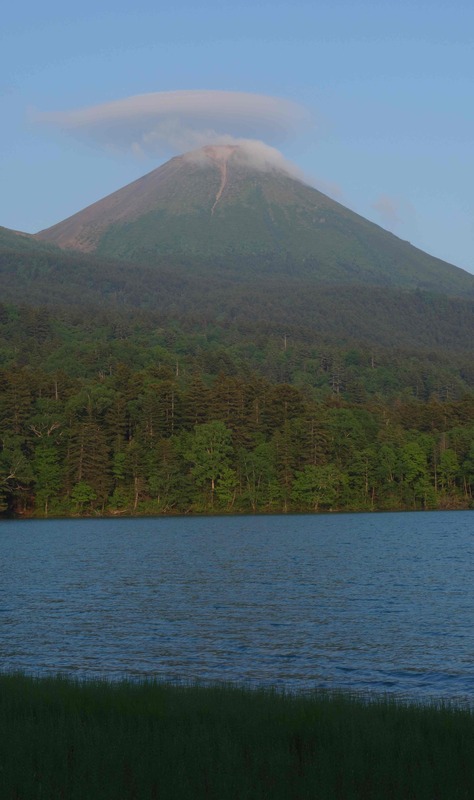 We are back on Hokkaido and today we climbed Mt Yotei, a nice stratovolcano, which looks like a small copy of Mt Fuji. The next morning we went up the 1,500 m to the top at 1,898 m. It was steep! But at least not icy like when we climbed Fuji-san. 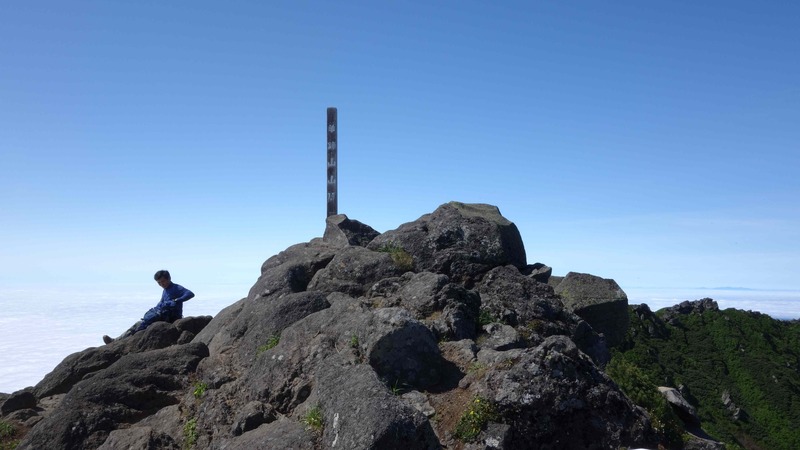 The summit of Mt Yotei. 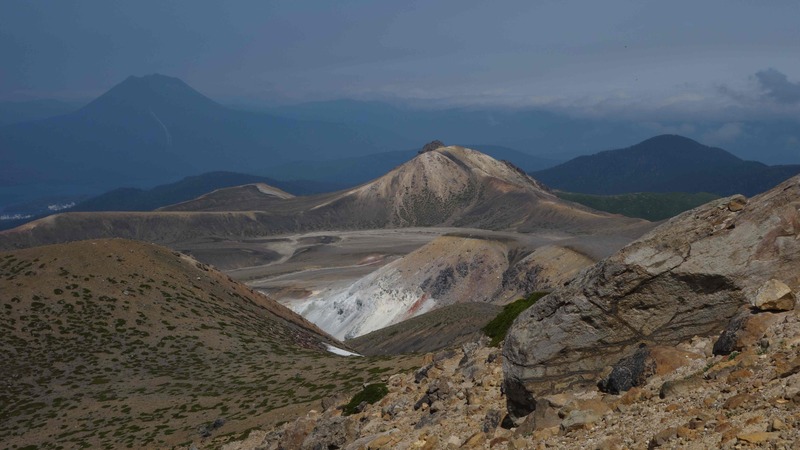 View to the beautiful crater of Mt Yotei. Thank you Aiko 🙂 we are happy to know that you are “with us” on the trip!